Jonny Copp, an avid mountain climber and founder of the Adventure Film Festival in Boulder, Colorado, was killed in an avalanche in China over the weekend. His parents, of Fullerton, Calif. were notified Sunday morning that their son was dead. "I am moved by everything he has done in his life," said mother Phyllis Copp. "He is my hero." Copp was one of three Americans caught in the avalanche. He had grown up in Fullerton, but lived in Boulder, where he ran the Adventure Film Festival. "We should have had at least another 40 years of him around," said sister Aimee Copp. "Thirty-five is not enough." Copp, 35, was with Micah Dash, 32, of Quartz Hill, Calif., and Wade Johnson, 24, of Minnesota. Rescuers are looking for Dash and Johnson but the two men are feared dead after the avalanche on a remote mountain in southwestern China. "These walls are his objectives," said father John Copp. "I'm sure he had one after this. We've had serious talks. Could we slow this down? Make it easier? It's like telling a race car driver not to go too fast." According to Dr. Eric Dash, the men were last heard from May 20 at the base of Mount Edgar, a peak of Mount Gongga in Sichuan Province, the Antelope Valley Press of California reported. A body found Saturday in avalanche debris at about 13,000 feet elevation was identified as Copp, according to the Minneapolis St. Paul Star-Tribune. "Film was one of his passions. He was a writer, a photographer -- he was literally one of the best kind of friends you can have," said Rob Shurr, spokesperson for the search-and-rescue effort. "On the Adventure Film website there is a letter that one of his friends wrote to him. It pretty much sums up everything about him." The Boulder Theater marquee read "Long Live Jonny Copp" after it was confirmed last week that a body was found on the mountain. The theater was the location of the original film festival. "His vision was to share the spirit of adventure, to bring the message of the mountains and what adventure meant to him," Shurr said. "The festival is this kind of expression of adventure through art. That might have been part of what motivated him in climbing. At the same time, somebody said the other day that he was the 'Macho Man Randy Savage' of alpinism." 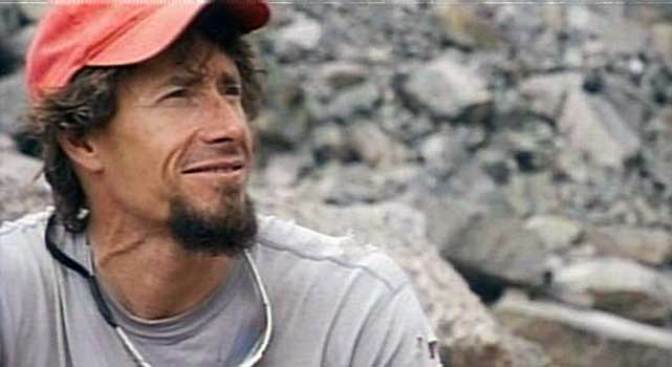 According to an e-mail from Johnson's parents sent to friends, the trio were scheduled to fly out of Chengdu, Sichuan's capital, on June 3, but did not show up for the flight, according to the Pioneer Press of St. Paul, Minn.
Rescuers were still searching for the other two, Li Zhixin, an official with the Chinese Mountaineering Association, told the Xinhua News Agency. Johnson was working for Sender Films, a maker of climbing and outdoor adventure films based in Boulder, the Boulder Daily Camera reported. Sender Films states on its Web site that, "Copp and Dash are highly experienced alpinists and professional climbers" who went to 22,368-foot Mount Edgar after receiving a Mugs Stump Award grant for their current expedition from the American Alpine Club. Johnson, a photographer, film editor and producer with Sender Films, was accompanying Dash and Copp to base camp and did not intend to climb to the summit, Sender Films' Nick Rosen told the Daily Camera. Friends and colleagues in Boulder were soliciting donations and helping coordinate search efforts in China, according to Sender Films. Gongga, Tibetan for "highest snowcapped mountain," is about 24,790 feet above sea level, attracts both tourists and mountaineers, Xinhua News Agency reported.